A complete system of hair care especially designed to help hair look and feel thicker and healthier. <>Our micro-enriched protein formula provides down to the skin cleansing action and conditioning leaving the hair soft and shining. 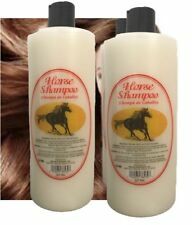 2 Shampoo Horse trail, cleansing shampoo with natural vegetable extract. Horse Shampoo 32 oz bottle. Cleansing shampoo with natural vegetable extracts. Size: 32 oz. An exclusive micro-enriched protein formula that leaves the hair soft and shiny. 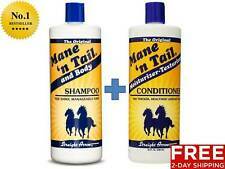 2 Bottles Of Horse Mane Tail Boby Shampoo Cavalier Coconut & Horsetail Extract 32oz Each. Coconut Oil & Horsetail Extract. For Your Horse Mane, Tail & Body. Horse Shampoo. You Will Receive: 2 Shampoo (as shown on the picture). Cabellina Shampoo DEL CABALLO HORSE For Mane Tail & Body 32oz each. For Mane, Tail & Body. Contains: Olive Oil, Coconut Oil & Horsetail Extract. You Will Receive: 2 Shampoo (as shown on the picture). CABELLINA SHAMPOO AND CONDITIONER DEL CABALLO HORSE 32 FL OZ EACH FOR MANE, TAIL AND BODY. CONTIENE ACEITE DE OLIVO Y COCO. CONTIENE EXTRACTO DE COLA DE CABALLO. MADE IN USA. CONTAINS OLIVE OIL, COCONUT OIL AND HORSETAIL EXTRACT. Shampoo Cola De Caballo. 2 x Shampoo ! DOBLE Concentracion De Extractos. 37.19 Oz (1000 mL) Each ! With keratin and oat surfactants. Oat surfactants are substances resulting from oat aminoacids acylation. They do not change skin barrier functions, form a thick creamy foam for gentle cleansing of head skin an hair. Item: Kumano Oil & Fat Horse Oil Shampoo 600ml. Horse oil "α-linolenic acid" which is a kind of unsaturated fatty acid. Because horse oil shampoo is non silicone formula. ・ If you can not see the perfect shampoo for yourself. Horse Force shampoo is the choice of celebrities! Apply a small quantity of shampoo to palms of hands, distribute it along the whole length of your hair. Rinse thoroughly. Repeat if necessary. Horse Force Conditioning Shampoo fits for frequent use. Shampoo De Zabila Para Caballo Aranda/ Aloe Vera Shampoo For Horses. Shampoo de zabila para caballo Aranda. Evita y previene su caída. Ingredientes: Alantoina, cloruro de benzalconio, jabon de coco natural, acibar de zabila, aceite de limon, clorofila. Shampoo of zabila for horse Aranda. The closest thing to taking your horse to the salon! Horse Salons rich concentrated formulation cleanses hair thoroughly yet gently drenching the hair with a luxurious easy to rinse lather removing residual buildup of flysprays detanglers environmental pollutants and hard water minerals. Horse Salon contains two coat conditioners and Aloe as a skin conditioner. The coat conditioners leave the hair feeling soft and manageable creating a perfect environment for brushing and braiding while the aloe keeps the horse’s skin moisturized and itch free. This is a new bottle of The Original Mane ‘n Tail Shampoo from Straight Arrow. The micro-enriched protein formula provides down to the skin cleansing action and conditioning, leaving the hair soft and shiny. Trending at $13.16eBay determines this price through a machine learned model of the product's sale prices within the last 90 days. Oat surfactants are substances resulting from oat aminoacids acylation. They do not change skin barrier functions, form a thick creamy foam for gentle cleansing of head skin an hair. They are less aggressive than normal surfactants. Our micro-enriched protein formula provides "down to the skin" cleansing action and conditioning, leavin the hair soft and shiny. Cabellina Del Caballo Shampoo 32 Fo. Trending at $23.48eBay determines this price through a machine learned model of the product's sale prices within the last 90 days. Coloured hair. This shampoo is easily washed out, has a nice fragrance and neutral pH ideally suitable to human skin. Repeat if necessary. Arginine is an aminoacid recovering inner structure of a hair at the cuticle level. (Exclusive micro-enriched formula w/ high lathering agents cleans without stripping natural oils. Gentle & safe ph balanced formula. Made in the usa. Guam, Puerto Rico, Virgin Islands, etc.). Check-Out Now! Caballo for Mane, Tail & Body. Unsaturated fatty acid It is the fat that is said and unsaturated fatty acids, and essential fatty acids must-have for the body. There is an important role that nourish the skin tissue in this unsaturated fatty acid. Tabibijin BA-YU Horse oil Shampoo 400ml / 13.5fl oz fast shipping. Condition is New. Shipped with USPS Priority Mail. 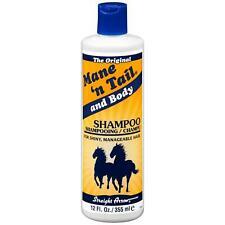 32 OZ Original Mane 'N Tail Shampoo Micro-Enriched Protein Formula Cleans & Fortifies With Moisturizers & Emollients Leaves Coat Soft & Shiny.The original mane 'n tail shampoo an exclusive micro-enriched protein formula that cleans and fortifies with moisturizers and emollients; leaving coat soft and shiny. Fiebings 32 OZ Horse Salon Shampoo & Conditioner Cleanses Hair Thoroughly Yet Gently Contains 2 Coat Conditioners & Aloe As A Skin Conditioner Aloe Keeps Horses Skin Moisturized & Itch Free Bottle.Fiebings 32 oz horse salon shampoo & conditioner cleanses hair thoroughly yet gently contains 2 coat conditioners & aloe as a skin conditioner aloe keeps horses skin moisturized & itch free bottle. This exclusive micro-enriched protein formula thoroughly cleanses the hair without stripping natural oils leaving it soft, shiny and manageable. This shampoo is safe for all hair types and chemically treated hair. (Deep cleaning color-enhancing shampoo & conditioning spray. Gentle and safe ph balanced formula contains no bleaches or peroxides. Made in the usa. Guam, Puerto Rico, Virgin Islands, etc.). Check-Out Now! 5 out of 5 stars - Original Horse Shampoo, 32-oz. 47 product ratings47 product ratings - Original Horse Shampoo, 32-oz. Our micro-enriched protein formula provides "down to the skin" cleansing action and conditioning, leavin the hair soft and shiny. Poultry/Chickens/Ducks/Feather. No worries! We market to 50 states as well as over 60 countries. Natural Biofactor Corcel Cola De Caballo ( Horse Tail ) Shampoo. Bathe your horse the way nature intended, with an all-natural shampoo made with organic essential oils. The chamomile soothes skin conditions such as sweet itch and rain rot providing gentle comfort and relief. A complete system of hair care especially designed to help hair look and feel thicker and healthier. We're happy to help. New Arrivals. We do not accept P.O. Boxes. Good for sensitive skin, Softens coat and hair with brightening benefits. Great for human use as well as Equine. Softens and rehydrates coat and hair. Brightens/whitens without stripping essential lipids from skin and hair. The closest thing to taking your horse to the salon! Horse Salon contains two coat conditioners and Aloe as a skin conditioner. Can't wait?. Feel free to give us a call and our trained support staff will be happy to help you. Farmona Herbal Care Field Horse Tail Shampoo Anti Hair loss 300ml. Healthy hair!